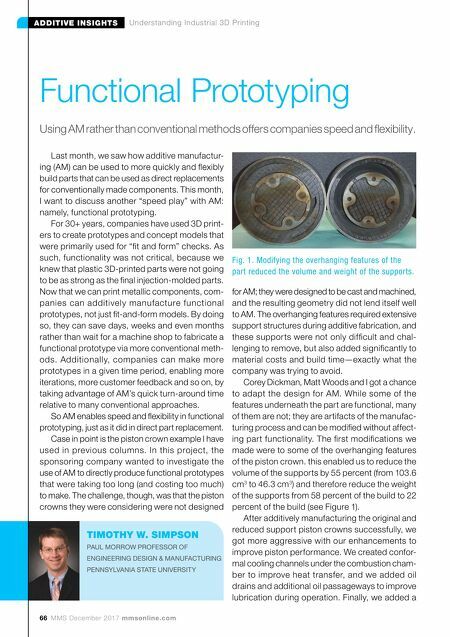 66 MMS December 2017 mmsonline.com ADDITIVE INSIGHTS Understanding Industrial 3D Printing Last month, we saw how additive manufactur- ing (AM) can be used to more quickly and flexibly build parts that can be used as direct replacements for conventionally made components. This month, I want to discuss another "speed play" with AM: namely, functional prototyping. For 30+ years, companies have used 3D print- ers to create prototypes and concept models that were primarily used for "fit and form" checks. As such, functionality was not critical, because we knew that plastic 3D-printed parts were not going to be as strong as the final injection-molded parts. Now that we can print metallic components, com- panies can additively manufacture functional prototypes, not just fit-and-form models. By doing so, they can save days, weeks and even months rather than wait for a machine shop to fabricate a functional prototype via more conventional meth- ods. 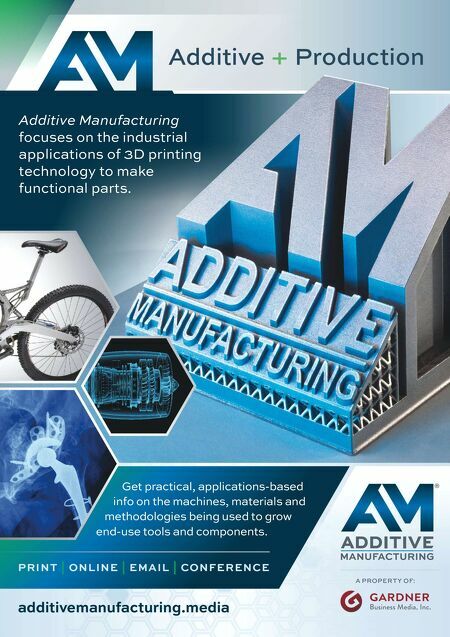 Additionally, companies can make more prototypes in a given time period, enabling more iterations, more customer feedback and so on, by taking advantage of AM's quick turn-around time relative to many conventional approaches. So AM enables speed and flexibility in functional prototyping, just as it did in direct part replacement. Case in point is the piston crown example I have used in previous columns. In this project, the sponsoring company wanted to investigate the use of AM to directly produce functional prototypes that were taking too long (and costing too much) to make. The challenge, though, was that the piston crowns they were considering were not designed for AM; they were designed to be cast and machined, and the resulting geometry did not lend itself well to AM. The overhanging features required extensive support structures during additive fabrication, and these supports were not only difficult and chal- lenging to remove, but also added significantly to material costs and build time—exactly what the company was trying to avoid. Corey Dickman, Matt Woods and I got a chance to adapt the design for AM. While some of the features underneath the part are functional, many of them are not; they are artifacts of the manufac- turing process and can be modified without affect- ing part functionality. The first modifications we made were to some of the overhanging features of the piston crown. this enabled us to reduce the volume of the supports by 55 percent (from 103.6 cm 3 to 46.3 cm 3 ) and therefore reduce the weight of the supports from 58 percent of the build to 22 percent of the build (see Figure 1). After additively manufacturing the original and reduced support piston crowns successfully, we got more aggressive with our enhancements to improve piston performance. We created confor- mal cooling channels under the combustion cham- ber to improve heat transfer, and we added oil drains and additional oil passageways to improve lubrication during operation. Finally, we added a Functional Prototyping Using AM rather than conventional methods offers companies speed and flexibility. TIMOTHY W. SIMPSON PAUL MORROW PROFESSOR OF ENGINEERING DESIGN & MANUFACTURING PENNSYLVANIA STATE UNIVERSITY Fig. 1. Modifying the overhanging features of the part reduced the volume and weight of the supports.